We often get questions about using a backpack and a pulk at the same time. Of course we’re partial to carrying the majority of your load in a pulk to get the weight off your back but, sometimes it’s necessary to carry some items in both a pulk and a pack if you’re hauling a lot of gear. We also usually carry a small daypack to have some items within arm’s reach. So, yes, a pulk and a pack can work together! There are a few different scenarios we’ll discuss regarding using a backpack with a pulk. a. If your pack has some heavier gear loops, they may work as an attachment point. You will want an attachment point where you can create a snug fit with the least amount of slop. This will give you maximum control of the sled (and because it gets old when your pulk is jerking at your hips all day with a loose attachment). Our harnesses have loops on them that the eye bolt of the pole fits over and then a carabineer is slid through to make a good, secure attachment point – you’d want to mimic something like that (see photo of our harness under option b). 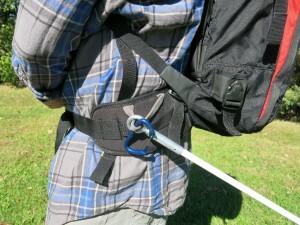 Here is an example attached directly to a pack waist belt (note that the attachment point is loose and would be improved with some modifications to make the poles fit more securely at your waist). b. 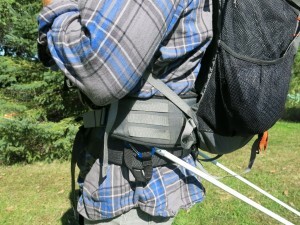 Another option is to sew webbing onto your pack belt to make loops like we have on ours. 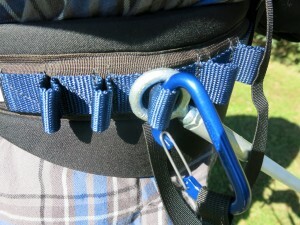 The blue webbing with loops shown in the photo of our harness below is what you’d want to sew onto your pack. 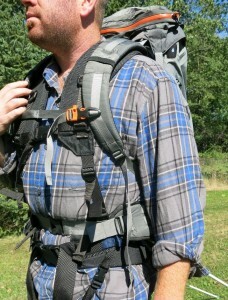 Another option, if you’d rather not modify your current pack belt, is to wear the pack over a SkiPulk harness. You can see in the photos below that the poles are attached to the SkiPulk harness which is underneath the pack. 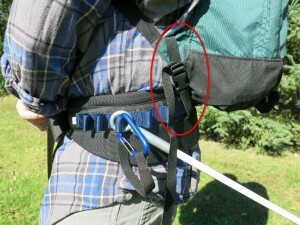 If you will be wearing a daypack or a small pack that doesn’t have a waist belt, or has a one inch, non-padded waist belt, our Hip Belt works great to connect to the shoulder straps and function as one system (you can see the strap from our Hip Belt attached to the strap of the daypack circled in red below). This way when you take your pack off, your hip belt is connected to it. And, while pulling your sled it all works together to distribute some of the weight. So, what’s the best option? Whatever is most convenient for you and has the most secure connection point! If you have the resources to modify your current pack, or if it already has some kind of loops on it that will be stable and create an attachment point with no slop, you will be just fine using those. The biggest thing is to make sure the pole attachments will stay snug against the belt for maximum control and comfort.